On Friday night, the Owls track & field teams traveled to CCBC-Essex’s Holiday Invitational, where the Boys team placed 5th of 16 teams. 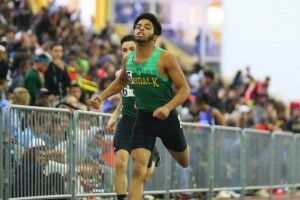 The Owls’ performances were highlighted by Taishaun Craddock, who regained the #1 position in 3A Maryland in the 55m Hurdles with a performance of 7.89 seconds. On the Girls competition, Keyona Henry threw a personal best of 28’ 1” in the Shot Put, which currently ranks her #4 in Baltimore County. Shawnie Allen placed 8th in the Shot, while teaming up with Madison Sautter, Semaj Jones, & Ta’Niya Johnson to place 8th in the 4x160m Relay. On Saturday, select members of the Owls track & field team traveled south to the PGSportsplex to compete in the Howard County Winterfest – one of the largest meets in area, comprising of 70 teams from Maryland, Virginia, Delaware, & Washington DC. In the 300m, Taishaun Craddock ran a time of 36.40 & Marquis Marable ran 37.30, which are the #3 & #8 performances in 3A Maryland this season. The duo combined with Jordan Williams & Adam Lmansour to run 1:34.33 in the 4x200m Relay, a new indoor school mark and a 3A Maryland #3 performance.